I had the good fortune to be able to visit Kenya a couple of years ago. Given the recent tragic events at the Westgate Mall in Nairobi, you might wonder if I’d go back, and yes, I would. Kenya is one of the most beautiful countries that I’ve ever seen, and the people are wonderful. The game reserves are superb, although they’re reduced to pockets of land surrounded by urbanization and reachable by drives of several hours over incredibly pockmarked roads that are an adventure in themselves. I have photos of vehicles driving all over the roads and shoulders in every direction to dodge the worst potholes – it’s quite entertaining when you’re in the middle of it, like being in a live pinball game. My favourite reserve was Samburu National Reserve in northern Kenya, which is an area that official travel warnings advise that you avoid, but the reserve is just on the southern fringe of the region, and the big issues are more along the Kenya-Ethiopia-Somalia border area. However, even before we left Nairobi we could see the cracks that exist in this wonderful country. The disparity between rich and poor was huge, one of the biggest I’ve seen in a country with a supposedly healthy GNP. In addition, corruption in the government is a widespread and well-known problem. I took a photo of a sign posted at the university in Nairobi stating that it was a “corruption-free zone” – clearly the university was making a statement. Yet out in the bush, surrounded by rolling hills that disappear into the hazy blue sky, flat-topped acacias hung with weaver-bird nests, blood-red termite mounds, antelope that stand on their hind legs to graze, cheetahs stalking dinner in the golden afternoon light, it’s easy to forget all the troubles of the world. In Kenya, you gaze off into the seemingly infinite wild landscape and feel like you’ve gone back in time to the beginnings of the world. Politics in most parts of Africa are convoluted, and when religions get involved it makes matters much worse. The question of how much the corruption in Kenya’s government influenced the attack on the Westgate Mall may never be fully known, but by all accounts it certainly allowed the terrorists a foothold inside the building. I think governments around the world should take note of how murky politics can widen cracks into gaping fissures that allow terrible events such as these to take place. Certainly tourism in Kenya is likely to suffer because of this attack, and it will be a shame for this magnificent country. 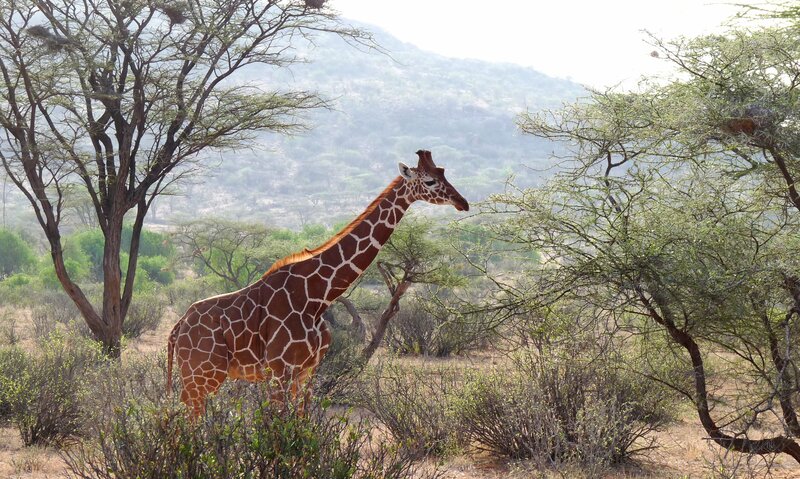 Lovely photo – brings back memories of my own trip to Samburu with my husband back in August, 1998. It was only 10 days after the U.S. embassy bombing in Nairobi, and I remember standing amidst the rubble in the streets looking up at the side of the building that had been completely blown off. Truly horrifying. Thanks, Andie – it’s one of my favourite reserves in Africa, so peaceful in contrast with all the troubles Kenya has had over the centuries.